Introduction: Upper gastrointestinal (GI) leaks are one of the most important postoperative complications following bariatric surgery. Standard treatment has been a combination of surgical or percutaneous drainage, parenteral nutrition and antibiotics. The endoscopic approach using flexible stents has been recently proposed as an alternative of treatment. Methods and procedures: Restrospective analysis of all patients who underwent endoscopic treatment with self expandable stents of upper GI leaks after bariatric surgery at our institutions. Results: 19 patients were analyzed, 14 with gastric leaks after RYGBP and 5 after LSG. 60% were female. Self expandable stents were used in all patients. Immediate symptomatic improvement occurred in 94.7% of them. Median prosthesis on site days were 132 (range 60-280) in the chilean series and 45 (range 21-91) in Brazil series. Two stent still remains on place (one because of chronic leak and the other by stricture after LSG). One patient needed surgical removal of the stent (5%). Three patients (15%) had broken stents that need to be removed (one by open surgery). Four patients (21%) had stent migration and five patients (26%) had severe reflux symptoms. There were no major complications. 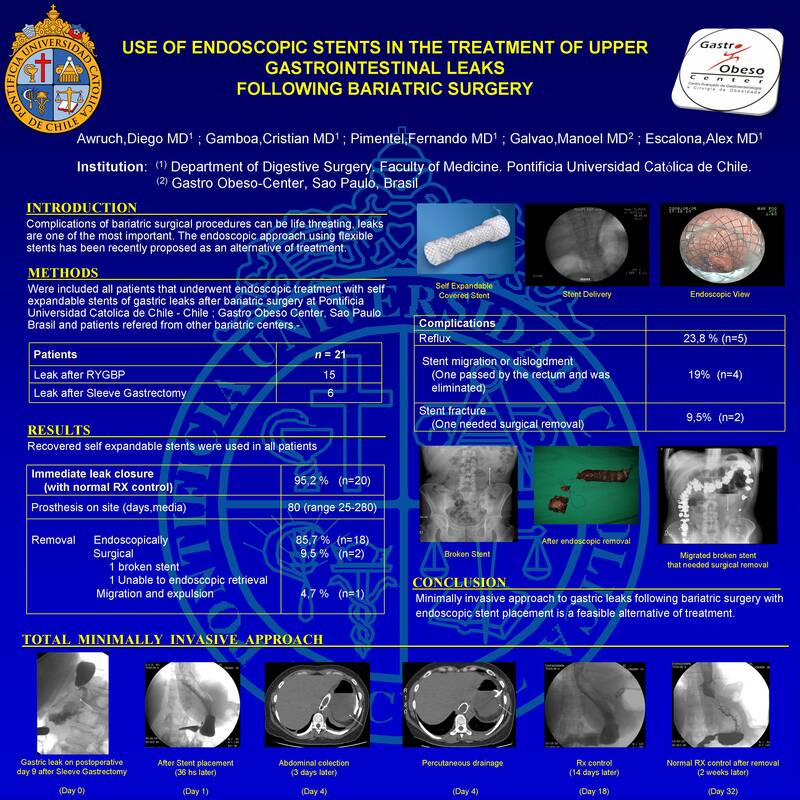 Conclusion: Minimally approach with endoscopic stent placement is a safe and feasible option of treatment of upper GI leaks following bariatric surgery.